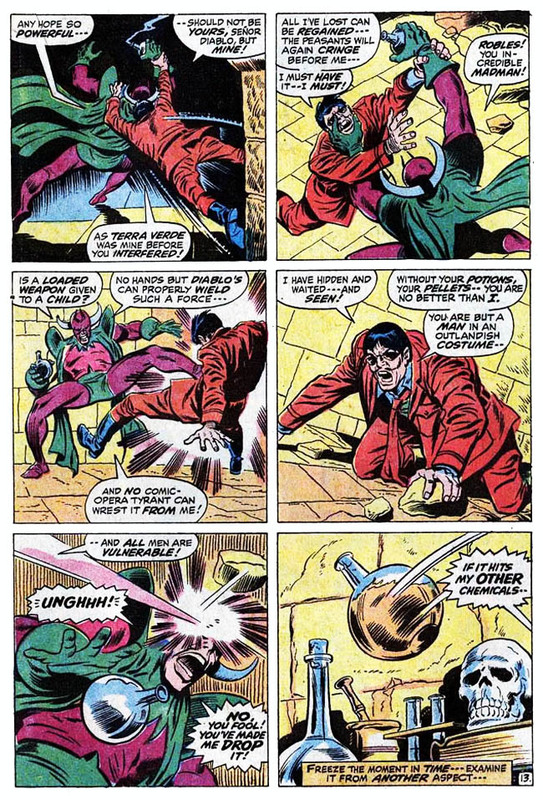 Legendary creators Jack Kirby and Stan Lee did a notorious one-hundred-four issue run on Fantastic Four in the Silver Age, a feat that was almost as amazing then as it is now. 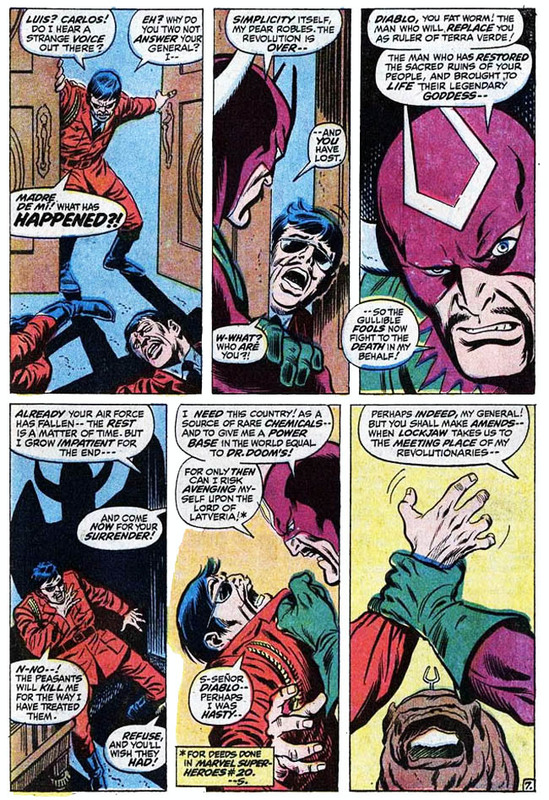 Of course, the creators who picked up the reins with #105 had a pretty tough row to hoe, and few of the events of the immediate-post Kirby run have long-lasting ramifications. 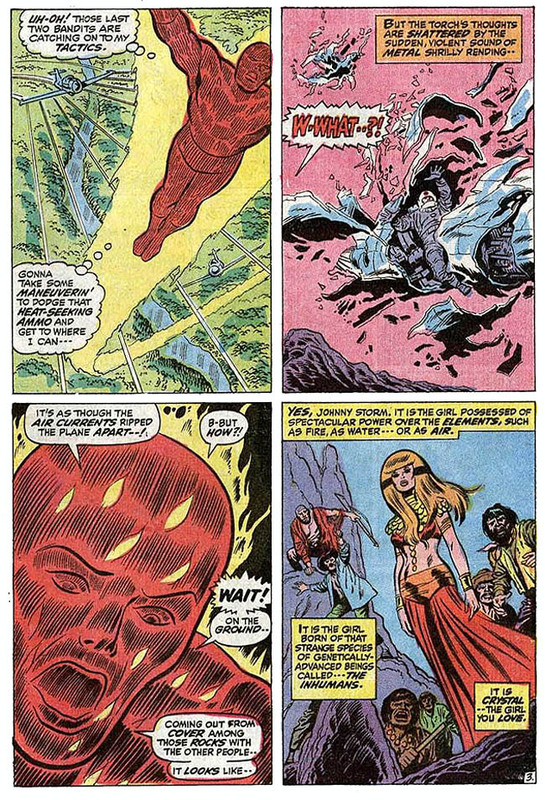 Of course, depending on your definition of “ramifications” (and possibly your definition of “long-lasting”) there are some interesting bits and pieces in these less-iconic seventies comics… Your Major Spoilers (retro) review awaits! The voices of the characters are solid. More than a little bit bland. 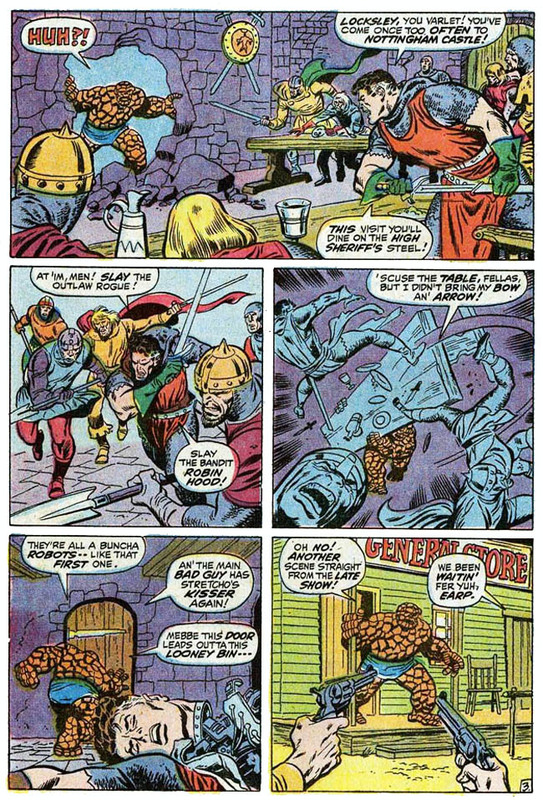 bombardment of cosmic rays that transformed the Fantastic Four into superheroes changed their lives, but didn’t alter their personalities. 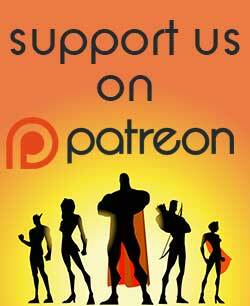 Mister Fantastic, The Invisible Girl, The Human Torch and The Thing quickly became explorers of the unusual, defenders of their world and world-famous superhero-types. 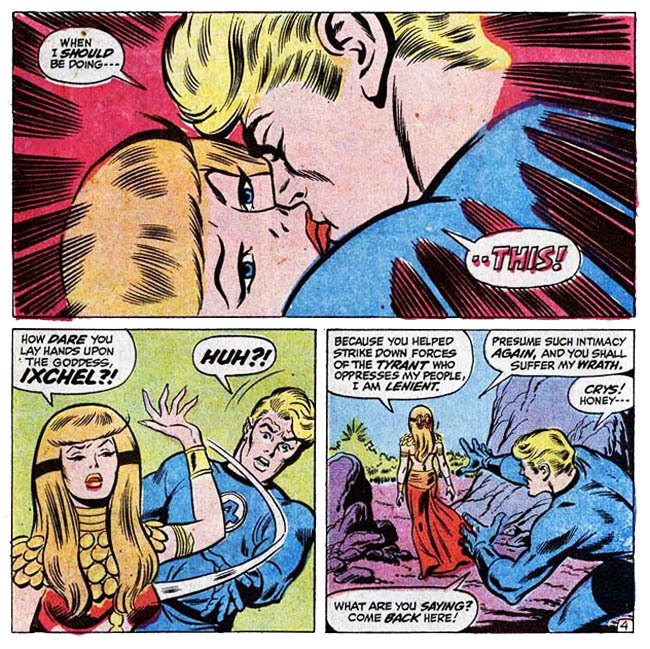 Things got very unusual very quick, not the least of which was a love affair between the impetuous young Torch and Crystal, princess of the Inhumans, a reclusive batch of proto-humans with super-powers. After a prolonged separation from her beau, Crystal has gone missing, and the FF have ventured out to find her. Whatever they might have prepared for, the heroes didn’t expect to have to face the air power of a small nation in combat! Her strange behavior continues, to the point where she attacks the Torch with her elemental might, smacking him down with a torrential gout of water, seemingly leaving him for dead. What might make her act so strangely? Could it beeeeee.. Okay, Diablo. but close enough for third world government work, right? …The REST… of the story. 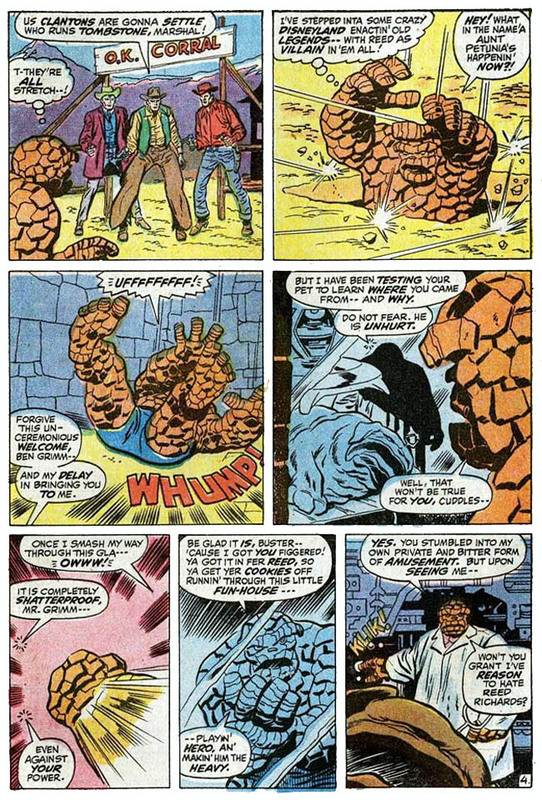 We begin as the Thing and Lockjaw materialize in a strange, dark alley, where they are suddenly attacked by a man calling The Thing, “Holmes.” A big rocky fist crushes the ersatz Professor Moriarty, revealing him to be an android with the face of REED RICHARDS! 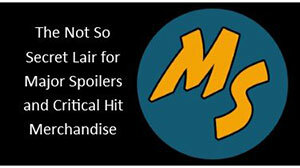 Responding to confusion with mass destruction (as always), The Thing finds even stranger games are afoot! 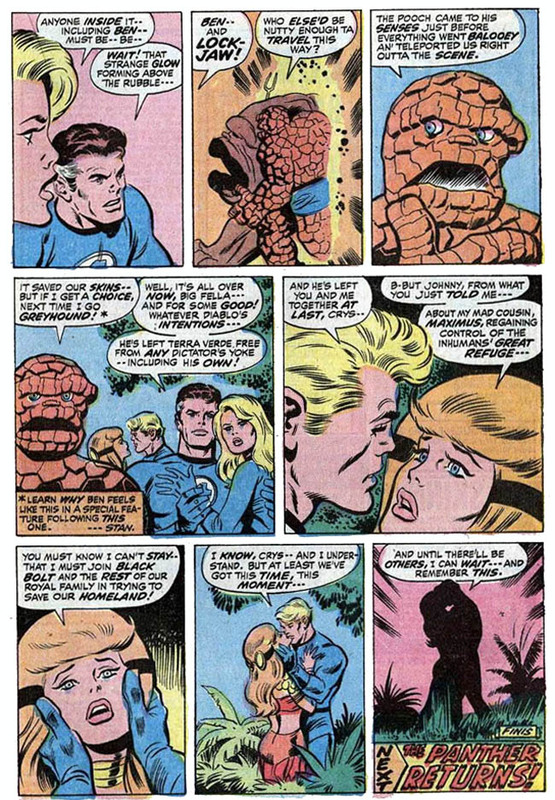 Of course, the other question is, what drew me to an otherwise normal issue of Fantastic Four? 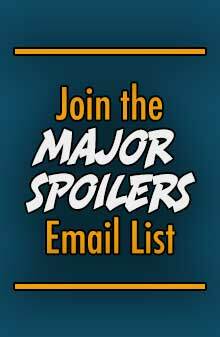 THAT story involves She-Hulk, and Dan Slott. 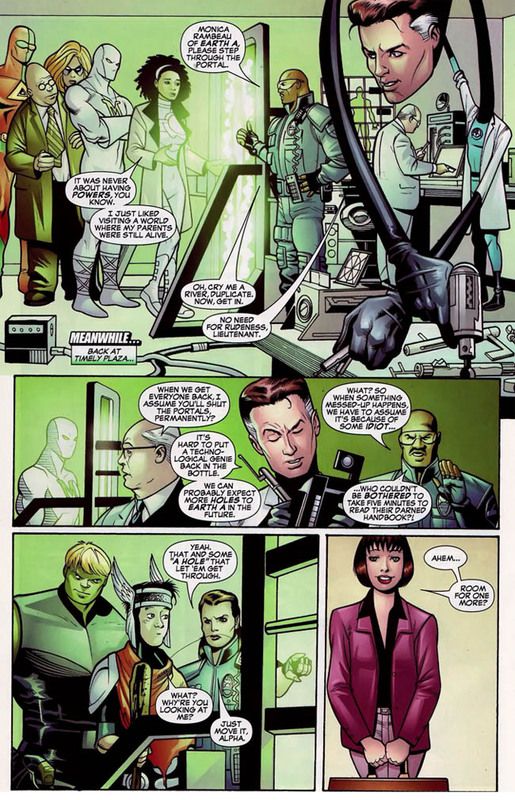 When Slott relaunched She-Hulk a few years ago, he found problems with a particular storyline that implied that Shulkie had enjoyed a dalliance with The Juggernaut. Throughout his run on the book, She-Hulk denied any naughty-naughty with Jugs, while he repeatedly referred to their fling in Uncanny X-Men and Excalibur. Eventually, it was discovered that a duplicate She-Hulk was extant, and that this version of Jennifer Walters came from none other than Earth-A! The line about “taking five minutes to read their handbook” and “some A-hole” letting things get through are clearly more meta than straightforward, but the idea that duplicates from Earth-A are responsible for any story that doesn’t make sense (or, to be honest, any story that I don’t care for) is a very appealing one, and one that adds a new dimension to the original tale. 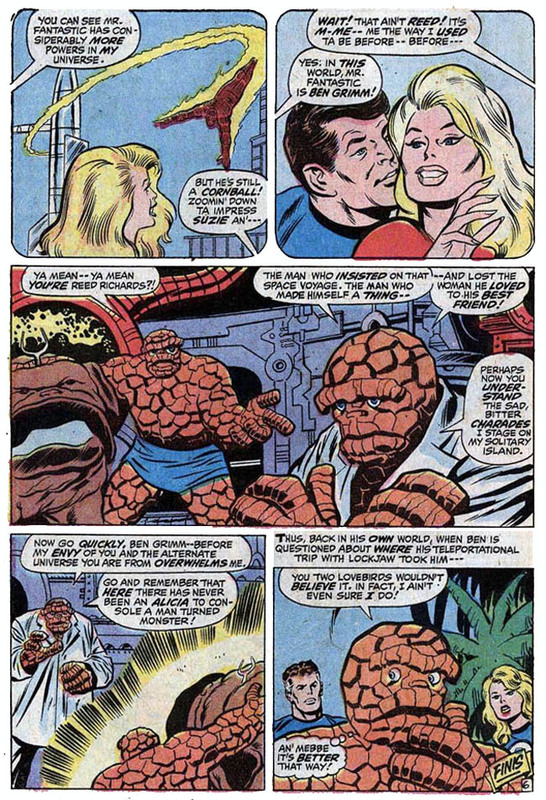 That said, it kind of needs the dimension, as this story falls squarely in a period of the Fantastic Four’s history that was particularly dry and more than a little bit blah in its execution. 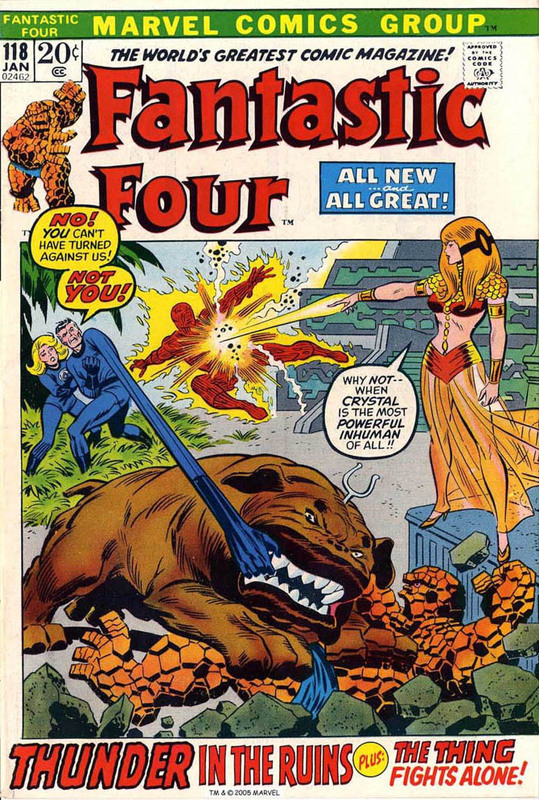 Fantastic Four #118 is nothing special, with John Buscema aping Jack Kirby as much as he could, and a sense of inconsequentiality permeating Archie Goodwin’s story, earning a somewhat disappointing (especially in comparison to that which came before) 2 out of 5 stars overall.